Bart Geerts, a UW professor of atmospheric science, will lead the Plains Elevated Convection at Night (PECAN) project next summer. The project, which involves 14 universities and eight research labs, will research how thunderstorms form at night in the southern Great Plains. University of Wyoming atmospheric science researchers recently secured a $1.15 million National Science Foundation (NSF) grant to study storms that occur at night in the southern Great Plains. Bart Geerts, a UW professor in the Department of Atmospheric Science, will lead the Plains Elevated Convection at Night (PECAN) project that involves 14 universities and eight research labs across the country and internationally. Zhien Wang, a UW professor of atmospheric science and the Templeton Faculty Fellow, and Tom Parish, a UW professor and department head of atmospheric science, will serve as co-principal investigators of the research project. The research will be conducted in Kansas, Nebraska and Oklahoma during June and July 2015, and will deploy King Air, UW’s research aircraft that is equipped with radar and lidar. In addition to funding King Air ($400,000) for those two months, the grant will pay for research, salaries, travel and publications ($750,000) during the next three years, says Geerts, who will head the project with David Parsons, director of the School of Meteorology at the University of Oklahoma. The overall $10.2 million project, funded primarily by NSF, also involves participation from the National Oceanographic Atmospheric Association (NOAA), NASA and the Department of Energy (DOE). Geerts hopes the research will provide a greater understanding of how these storms are initiated and maintained during the night, as well as yield more data that can help forecasters improve warning times. Geerts says intuition leads one to surmise that since the Earth’s surface is warmer during the day, more thunderstorms would pop up as a result of surface heating. But thunderstorms are mostly nocturnal across the Great Plains. Some key mechanisms that may have an impact on night storms, Geerts says, are the nocturnal, low-level jet streams of wind approximately 1,000 feet above the Earth’s surface as well as the stable boundary layer, which is considered the lowest layer of the atmosphere, and develops due to the Earth’s surface cooling at night. Traditionally, the environments of such storms have been examined using small weather balloons with radiosonde, and aircraft flight-level measurements. However, these methods cannot offer needed spatial and temporal structures of fast-moving storm environments. 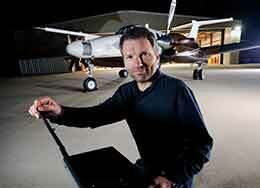 The King Air compact Raman Lidar will be able to measure water vapor mixing ratio, clouds and aerosol. Lidar, an acronym for light detection and ranging, is an optic remote sensing technology that can detect and measure molecular aerosols and cloud droplets in the atmosphere. However, a new, more powerful Raman Lidar -- under development by Wang and Perry Wechsler, a UW senior research scientist and chief engineer of King Air -- will not be ready in time for use during the PECAN project, as originally hoped, Geerts says. So, the research group won’t be able to measure temperature profiles next summer. Last year, Wang and Wechsler received a $1.2 million NSF grant to develop a Multi-function Airborne Raman Lidar (MARLi). The Raman Lidar is designed to simultaneously measure profiles of temperature, water vapor mixing ratio, clouds and aerosol continuously below the aircraft and down to the surface.